White cotton chintz with polychrome Indian floral print; "compères" front with lacing; border of printed fabric at center front, hem and cuffs. This dress' stylized Indian floral pattern has the colored as its focus. Red, along with blue, green, yellow, and other various colors, were applied both by hand paint and by woodblock prints. 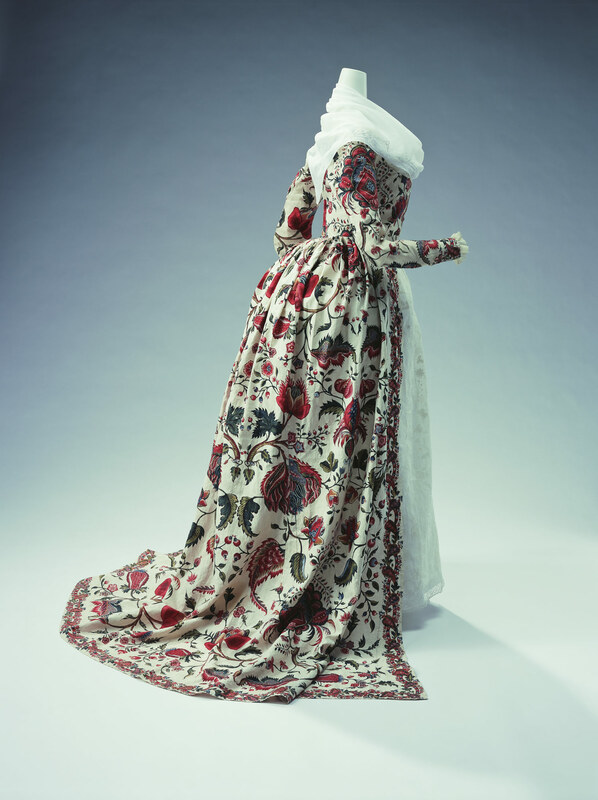 Though the dress is "robe à l'anglaise", it is assumed to have previously been "robe à la française" from the traces of sewing that are leftover. Indian printed cotton textiles (Indian chintz) became well known and hugely popular in the West during the 17th century. These printed cotton textiles with delicate, foreign motifs and vivid colors were not only used in interior decorating, but were also quite favored for use in clothes making. Indian chintz was called "indienne" in France (meaning, "from India"), and "chintz" in England (meaning, various colors).